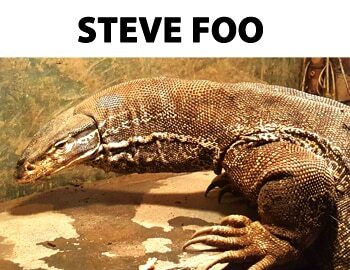 Varanus panoptes horni is a reasonably lean monitor lizard and does not put on the bulk that its African cousins often do. 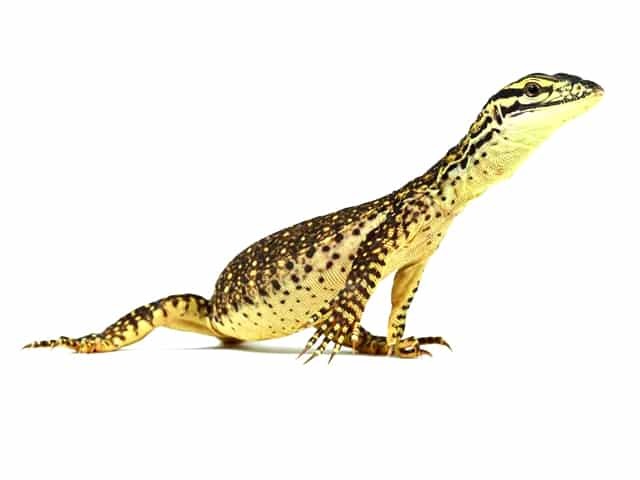 Most Varanus panoptes horni are yellow in color, with a background of brown or dark tan. Their color often varies with place of origin or even the individual. They are also known as yellow-spotted monitors. As with most monitor species, male Varanus panoptes horni are more robustly built than female Argus monitors, with more powerful, bulky front legs. A large enclosure with a proper range of temperatures should be provided, Argus monitors are very active lizards and will use the given space optimally. Best off in a large enclosures at least 2.4 x 1.2 meters (8 x 4 feet) with deep dirt and sand mix for digging. A shelter can be provided or a paving slab adequately fastened in place is also good as they will dig out there own hide under it. It’s generally accepted that they prefer a soil/sand mix pretty deep as these are digging machines. You should provide at least 0.30 meters (1 foot) deep substrate for their enclosure. Lights are provided for at least 10 hours per day, allowing the lizards to bask under their basking area. My daytime ambient temperature is 31 °C (88 °F) with a cold end at 27 °C (82 °F) and basking temperatures range between 62-65 °C (145-150 °F). Night temps should never go below 26 °C (80 °F). A water container should be provided with clean water, preferably a large heavy one so they can’t tip over. The humidity inside your enclosure should be at 65%. A high quality digital hygrometer is mandatory for monitoring the environment inside your enclosure. Guessing the humidity will not work. I feed my animals usually 4/5 days per week with food items such as mice, rats, chicks and large locusts. They can be handled and are usually reluctant to bite but will hiss and tail-whip plus there claws can cause some damage so careful handling is advisable. One of the most common substrate these days is a bio active substrate which I prefer to use and I believe is the way to go but additional spot cleaning will help. You should also change the water whenever it gets dirty. I tend to increase the humidity of my enclosure during shedding periods by placing an additional water bowl on the hot end of the enclosure. You can also mist the enclosure instead of using my method. Usually they shed with a constant time frame but once the growth spurt kicks in (2 years old) this slows a bit. Argus monitor is a tough lizard and will not easily become sick as long as good hygiene, appropriate diet, proper temperatures and a stress free captive environment are provided.